This versatile triple-speed Ethernet interface can operate as either a 4-port Gigabit Broadband Router or a 5-port Gigabit Switch, selectable with the flip of a switch. In Router mode it's capable of up-linking with virtually any ADSL or Cable modem, with support for Static IP, Dynamic IP, PPPoE, PPTP, and L2TP protocols and features a robust SPI/DoS firewall to protect users from Internet attacks. 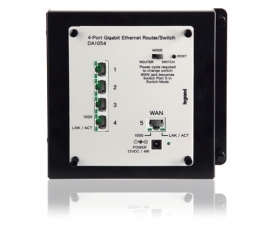 The DA1054 can easily be put into Switch mode for use with gigabit Ethernet devices like IR set-top boxes or workstations. With a simple cycling of power the WAN port becomes a fifth switch port.